Focusing on two cities that are exemplar for their urban regeneration, London and Barcelona, two public events will bring together urban professionals, academics and community activists to situate questions around temporality at the forefront of the research agenda on urban change. 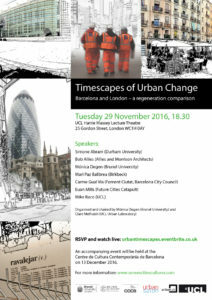 The first event, hosted by the Urban Lab and Urban Salon at University College London, on the 29th of November 2016 will discuss and reflect from a long term perspective on the regeneration of these respective cities and discuss: How do temporal considerations (investment cycles, deadlines, changing global and local politics) affect the planning and construction of buildings and cities? What kinds of times are fostered or eliminated in the landscape of urban regeneration projects? How do different temporal narratives, practices and ideologies converge or conflict to produce a particular sense of place? What is the relationship between neoliberal time and urban planning? Which lessons can be learned from the regeneration processes in both cities? Each of the events will have a closed door event to allow for in depth discussion and a public event which will be life streamed, please click on the below London/Barcelona links to see the programme timings.